Be Deliberate – FREE printable! You guys, summer is here! I love the freedom that summer time brings. If you are like me, you are SO ready to relax! This mama is TIRED and ready for a break! Maybe it’s the heat, or maybe it’s the lack of routine, but something about summertime just makes me want to do a whole lot of nothing. Of course, doing a lot of relaxing can be a good thing, and is occasionally vital and necessary. However, I often find myself in a bit of a rut during summer. For me, the problem boils down to becoming too relaxed, in all areas of my life. Like I said, I am TIRED and just plain burned out. I feel like I deserve a break. I’m not alone in this, right? The answer for me is knowing that I need to be more deliberate in my daily choices. In his latest conference address, President Monson said, “It has been said that the door of history turns on small hinges, and so do people’s lives.” There are many things that I need to be more deliberate about. To help motivate me, I have created this PRINTABLE to help remind me of what choices I need to make to be more deliberate in my life. It includes an 8×10 sign, as well as a 4×6 card to write what you would like to be more deliberate about. Honestly, I have a laundry list a mile long to work on (who doesn’t right? ), but I am just going to work on one goal at a time. 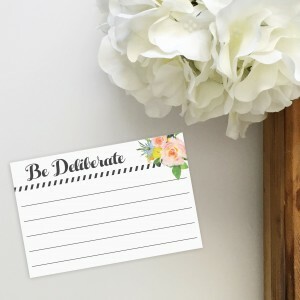 What are some things you need to be deliberate about? 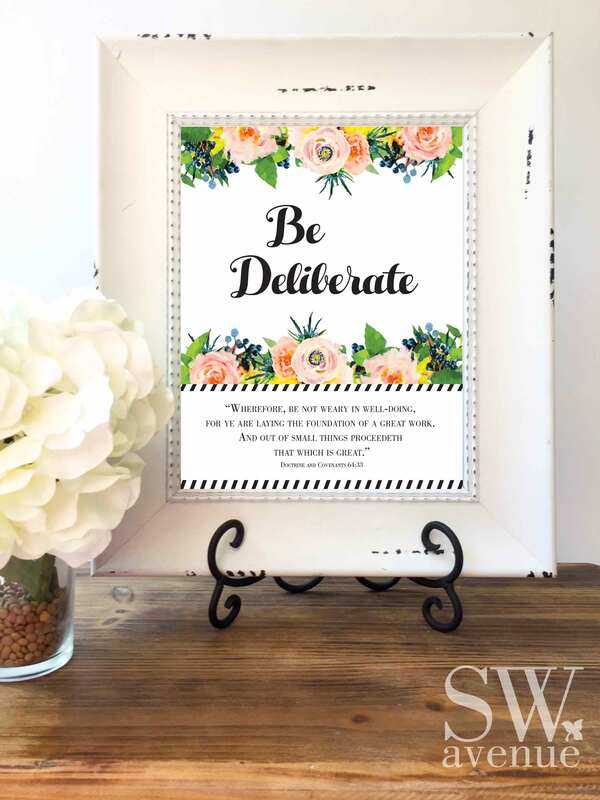 Click Here for this Printable! This entry was posted in Printables and tagged Free printables, goals, Melanie B. on June 7, 2016 by Melanie Biddulph.